Is My Child a Good Candidate for a Cochlear Implant? If your son or daughter has been diagnosed with severe hearing loss, you may be worried about finding the best way to ensure that your child’s ability to communicate and enjoy all that life has to offer is not restricted. It is possible that a hearing aid may be all that he or she needs to hear sounds better or a more advanced treatment option, such as a cochlear implant may be recommended depending on your child’s level of hearing loss and individual circumstances. While there are numerous treatment options available to enhance a child’s hearing abilities, it is important to remember that there is no one-size-fits-all solution. At Pediatric ENT Associates, our pediatric specialists strongly believe that every child deserves comprehensive treatment to find the best solution for his or her unique needs. Pediatric ENT Associates have a team of experts available to evaluate whether a cochlear implant will be beneficial for your child. From pediatric surgeons to speech-language pathologists and audiologists, we carefully examine a child’s potential as well as his or her family’s for thriving with a cochlear implant. Should My Child Wait to Get a Cochlear Implant? If your son or daughter is eligible for a cochlear implant, it is typically strongly recommended that he or she undergoes the implantation procedure as soon as possible. Children as young as 12 months of age benefit from having a cochlear implant, because it provides them with vital exposure to sounds during the most critical time of language acquisition. Schedule a Consultation with Pediatric ENT Associates Today! 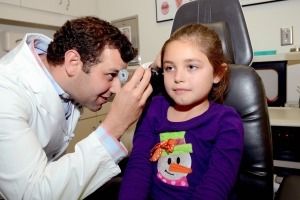 If your child has any degree of hearing loss and you want to see his or her language develop like other children their age, then reach out to the Pediatric ENT Associates in Birmingham to see the difference we can make in you and your child’s life. Call (205) 831-0101 or fill out the online contact form today. Next, read Is You Child Suffering from Sleep Apnea?